Our team of professionals are dedicated to providing a superior level of service which exceeds the requirements of our clients. Our range of specialist skills can be viewed here. The Thompson Clarke team holds a wealth of experience and industry expertise. To read more about our qualifications and to view our team profiles please click here. The Thompson Clarke team has been employed by international vessel operators (both afloat and ashore), ports, government maritime safety agencies, investment and container leasing companies, to undertake either commercial or operational reviews. 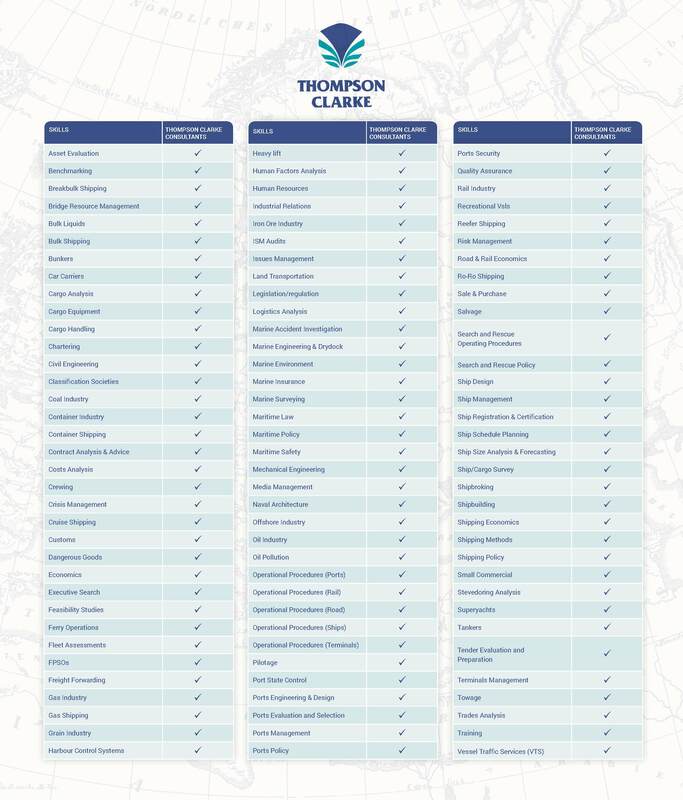 On a number of occasions Thompson Clarke has been commissioned to apply their unique expertise in the provision of both port and shipping commercial due diligence services in the case of port privatisation campaigns. All Commercial Analysis and subsequent reporting can be completed for both public and private sector clients, depending on individual requirements. Privacy and confidentiality agreements cover all commercial analysis reports, ensuring the protection of all Intellectual Property and Classified Information. International container carriers looking to establish new routes. Terminal operators and stevedores reviewing the viability of new investments. Port authorities reviewing options for market development. Major cargo interests seeking to improve their shipping and logistics . Thompson Clarke showcases a breadth of consulting expertise in all aspects of shipping operations and management, enabling us to provide assistance in commercial and operational re-organisation. Thompson Clarke regularly advises clients on HR issues such as; employment arrangements, maritime skills availability and internal resourcing/capability requirements. Thompson Clarke has extensive experience in investigating marine incidents on behalf of maritime safety agencies in Australia. The results of these investigations have often highlighted systemic issues affecting the delivery of positive maritime safety outcomes, while assisting marine safety regulators in developing timely solutions. Thompson Clarke has undertaken major projects in the area of application of communications, navigation, surveillance and other information, and communications technologies. Thompson Clarke provides local or wider shore-based maritime services, intended to enhance maritime safety, operational effectiveness, and/or regulatory compliance (particularly in mission critical and safety of life environments such as port control and waterways management centres). In conjunction with our global network of leading security consultant partners, Thompson Clarke has delivered ISPS Code compliant port and ship security assessments, security plans and security training in the Australian, New Zealand and Middle Eastern markets. Thompson Clarke consultants are also trained and experienced ISPS Code auditors, possessing the appropriate knowledge and skills to assist in all Maritime Security issues. With increasing attention being paid to ship safety and marine pollution prevention, Thompson Clarke has undertaken major reviews and audits for statutory authorities concerned with maritime safety and marine pollution. Thompson Clarke has also surveyed ship’s waste reception facilities at ports around Australia. The company has completed a number of ballast water-related research projects for Australian government authorities and has a detailed knowledge of contemporary operational, management and regulatory issues. Thompson Clarke, through extensive experience, is able to assist companies in becoming increasingly environmentally friendly in their business processes, whilst adapting a 'green' approach to all areas of business operations. Thompson Clarke has undertaken major organisational and performance reviews of maritime safety administrations. All Thompson Clarke consultants have extensive experience in all areas in all areas of maritime safety, developing a comprehensive knowledge and delivery capability of all contemporary marine safety management and associated regulations. Thompson Clarke maintains a high level of expertise in the process of marine hazard identification and associated risk assessments in all aspects of the maritime environment. All risk assessments undertaken by Thompson Clarke, unless specifically required otherwise by our client, are completed in accordance with AS/NZS ISO 31000:2009. Thompson Clarke has considerable experience in the cruise and ferry sectors of the maritime industry, with the ability to provide strategic advice for new and existing services. This service compliments our commercial analysis and recommendations we are able to provide for the design and modification of vessels and terminals. Shipping component of new mining projects. These reports are also delivered in addition to the practical advice on ship operating issues that is unique to the breadth of in-depth industry knowledge and experience as showcased at Thompson Clarke. Thompson Clarke's combined management, operating and financial control experience enables our team to offer expert review services and advice to shipping operators on practical and effective strategies for reducing operating costs. Thompson Clarke has experience in assisting its clients with the preparation of technical specifications and evaluation of tenders for essential port and shipping services. This includes the provision of necessary inputs to set the service standards required, developing performance evaluation criteria and assistance with evaluation of available options from an operational and commercial perspective. Thompson Clarke maintains a comprehensive database of quality maritime industry senior managers seeking alternative employment opportunities. We work with our clients to match the most suitably experienced and qualified executives with their needs. The general shortage of quality candidates within the industry means this particular service provided by Thompson Clarke is always in great demand. This list of services is not exhaustive but provides an illustration of some of the projects undertaken by Thompson Clarke. Copyright © 2019 Thompson Clarke. All Rights Reserved.